The club has continued a strong commitment to its nominated charity, Marie Curie Cancer, and with over 20 years of fund raising we decided to make a bigger effort over the summer. Funds came in from golf competitions, the forfeits from the charity bunker on the 6th hole (15th), gifts and donations. The special boost came from an idea from Paul McCarthy, who lent us his own Olympic Torch that he had been privileged to carry as part of the 2012 pre-Olympic relay through Lincolnshire, on its way throughout the UK. So, during the month of the August Rio Olympics we took donations for photos to be taken with the torch. The Tuesday Ladies also played a Pentathlon of Golf Competitions and the total sum raised here for Marie Curie Cancer in the July to October period was £722.33. The total for the year was £1,047.33. The Seniors’ Captain’s morning raised £119 for the Skegness RNLI Lifeboats. The national endeavour, Sports Relief, in March inspired the raising of £117.32. In November, our collection for The Royal British Legion also realised the sum of £135.84. Gold £50, Silver £30, Bronze £20. for the best score not in the main Gold, Silver and Bronze prizes. Age Groups: 8 to 69, 70 to 79, 80 to 89, 90 +. There was a special competitions for ages 1 to 11 and INACTIVE HANDICAPS eir first golf competition, Amelia Spicer (age 10) won the 9 to 11 year age group, and sister Phoebe (8) won the 8 years and under. Danny Harris (4) was runner-up. All junior putters, not in the prizes, deserve mention for excellent putting skills, sportsmanship and etiquette. Charlie Hare (10), Alicia Lewis (10), Tom Howes (11), Sam Howes (9), Tilly Lewis (8), Cameron Harris (7), Danny Harris (4). One year old, Jacob Dyson, is the youngest Tiger member and observed it all from the fringe of the putting green. He was presented with a large chocolate Gold Medal. 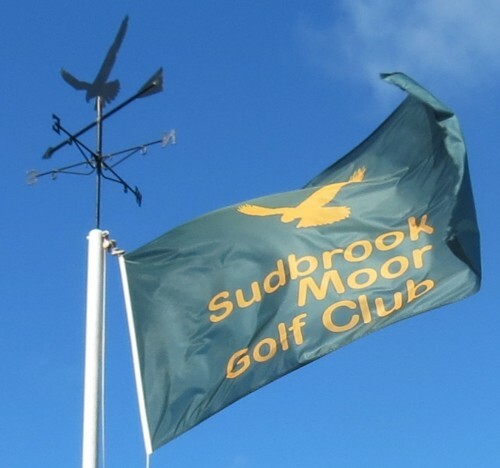 To encourage players and their friends to be at the Prize Presentation at approximately 2pm, there was a Raffle for a £99 Voucher to be used against a 2013 Sudbrook Moor Golf Club Membership. The Voucher would only be presented to the winner if they were there in person to receive it. If the name drawn first out of the hat was not present, there would be a re-draw. Tickets were £1.